Review date: 13th September 2007. It is, finally, possible to buy a cheap power consumption meter here in 230-volt-nominal Australia. In the USA, the P3 Kill-A-Watt meter is deservedly popular; it's only $US21 from Amazon and is more than accurate enough for domestic purposes. But the Kill-A-Watt, and other cheap American meters, are useless for people in countries that have a different mains voltage. Decently-priced power meters have been available in the UK for a while now; they'll work fine in Australia with a couple of plug adapters on either side. That's hardly an elegant solution, though, and Aussie shoppers will probably pay more to have such a meter shipped to them than the thing cost in the first place. Until recently, the only off-the-shelf power meters in Australia have been possibly-very-good, definitely-very-expensive models. There was also this neat kit, which is a full-featured meter but costs more than a hundred bucks... and then you have to solder it together. Precise down-to-the-last-milliwatt accuracy isn't important for a domestic wattmeter, though. As long as a meter corrects for power factor and is accurate within a few per cent, it'll do just fine for people who're interested in tracking how much electricity different domestic appliances use. I'm in Australia, and I've been looking for an affordable power meter for a while. I can get ballpark figures by splitting a conductor out of a mains cable and putting a clamp meter on it (that split lead is just one of the alarming cables at my disposal...), but that's not very accurate. ...Kill-A-Watt-style cheap meters suddenly popped up on the local market. They're sold by Jaycar, catalogue number MS6115, for $AU39.95. If that's just too cheap for you, here's an Australian eBay seller who has them for $AU54.95 (and still has stock, as I write this!). I got mine brand new from this dealer, who was for some reason unloading a few meters for only $AU19.99 including postage, but unsurprisingly seems to have run out now. There's not much to see on the inside. The main chip's potted under a blob of black epoxy, and the circuit board manufacturer's name is apparently "Richar". The boards both have revision dates at the end of 2006, for what that's worth. More importantly, there are a couple of trimpots for current and voltage calibration, so a meter that drifts or comes from the factory with lousy calibration can be fixed. The mains plug and socket assembly in the meter is a couple of separate mouldings, allowing the rest of the meter to be adapted to other countries' socket standards. I wouldn't be surprised if this same meter has been available in quite a few other 220-240VAC countries before the manufacturers got around to making a version with Australian connectors. The only thing that makes me suspicious about this meter is that, although it's got a power factor display, the number never seems to budge from "100", which I presume is supposed to indicate a power factor of 1. This review shows a Kill-A-Watt successfully displaying a non-unity power factor; this meter can't seem to do it. Power factor ought to be 1 for simple resistive loads (heaters, toasters, incandescent light bulbs), but things like old PC power supplies (the kind with a red "115/230V" switch on the back) or lightly loaded motors ought to have power factors considerably below 1. I've tried the meter with a few old PSUs (two sitting there naked, one powering a PC), and with a desk fan, and it still always says "100". I even tried removing the impeller from the desk fan, so the motor was turning with no load at all; the wattage figure dropped a bit, but the power factor was still allegedly 100. If you don't correct for power factor, then something like an old PC PSU with a PF of about 0.7 will appear to draw 1.4 (one divided by 0.7) times as much power as it really does. But when I plugged an eleven-watt compact fluorescent lamp into the meter, it read exactly 11 watts. If it wasn't correcting for power factor, it ought to have reported a higher number. So maybe it's doing it, and just not reporting the power factor figure properly. I think the deal with these cheap meters is that they do indeed measure cos(Phi), the phase shift between voltage and current, which allows them to compensate pretty well for power factor. They don't, however, notice if the voltage and/or current waveforms aren't a nice clean sine wave, which they won't be if devices with poor power factor are pushing extra amps back and forth all the time. Basic cos(Phi) power factor detection is a lot better than nothing, though. The Fluke Model 40 recommended on the above-linked page no doubt does a much better job, and plenty more besides. But the current version of the Fluke 40, the 43B, costs $US2500. So I think I'll stick with my twenty-dollar meter for now, thanks very much. UPDATE: Another reader has now pointed out this discussion, where commenters have I think hit upon the reason for the odd power-factor numbers. These meters appear to report the power factor of inductive loads reasonably accurately, but then "top out" at a power factor of 1, and are unable to display capacitive-load power factor correctly. Apart from the power factor thing, this meter seems to be functionally equivalent to the Kill-A-Watt - voltage, current, watts, maximum watts, cumulative kilowatt-hours, settable price per kilowatt-hour, et cetera - except it's only got three control buttons, plus a little press-with-a-pen reset button. The only button I've actually needed to use so far is the cycle-through-modes button, though, so that's fine with me. On to some actual measurements. In this blog post, I explored the not-entirely-sensible notion that some significant environmental good can be done by displaying darker colours on your monitor. And, back in this letters column, someone asked about the power consumption of 30-inch LCDs. Now that I've got a 30-inch LCD, and also this meter, it was time to put these claims to the test. As I explained in the letters column, the 30-inch Dells like my 3007WFP-HC may have a 147-watt power rating, but that only applies when they're running at their rather painful maximum brightness. You don't need - or even want - your monitor to be that bright if you're not using it in a very bright environment; it's just burning watts and straining your eyes for no gain at all. In my office, I run my monster Dell at its minimum brightness. At this minimum brightness, my new power meter reckoned my monitor was consuming only seventy-something watts, depending on what was displayed on the screen. An all-black screen was somewhere between 67 and 70 watts; an all-white one was about 77. Winding the brightness up to maximum boosted the all-black power consumption of the Dell to 133 watts, with an all-white screen now consuming 142. Even if these numbers aren't very accurate, it's still clear that the power to be saved by using darker screen colours, or the silly "Blackle" black-Google site, is completely dwarfed by the power you can save by running your monitor at a lower, and probably ergonomically superior, brightness. It doesn't hurt to save the single-digit watts that darker screen colours can achieve, but the difference between the most I could make the monitor draw at minimum brightness and the least it drew at maximum brightness is more than fifty watts. A heavy computer user could easily save a hundred kilowatt-hours a year just by doing this. That's not actually going to save you a whole lot of money unless your local electricity tariffs are unusually high, but it's nonetheless a quite impressive amount of energy. Since I've colour calibrated this monitor, I've throttled back some of its colour response and slightly reduced the all-out brightness it can manage. Without calibration it'd draw a little more at full power. So the 147-watt nominal power consumption for this monitor actually does seem pretty much bang on, which gives me more faith in the accuracy of this cheap meter. But, to repeat, the 147-watt number only applies if the brightness is all the way up. I habitually turn my monitor off manually when I leave the computer. I've got a screen-standby delay set as well, in case I forget. I was interested to see how much power the monitor still draws when it's "off". The word "off" deserves to be in scare quotes, when you're talking about a lot of modern appliances. In the olden days on/off switches were always "hard", straightforward switches. Turn switch off, device is physically disconnected from the mains, device consumes zero power. But an awful lot of modern appliances have "soft" on/off switches, which just put the device into a (relatively...) low-power standby mode. Soft power switches only work because a bit of the monitor's circuitry stays powered and looking to see if something bridges the contacts behind the switch. That circuitry uses some power. Hence, so-called "vampire" draw. My giant Dell's "vampire" power consumption is quite high, whether or not you turn it off by hand. In standby mode, with its power indicator glowing orange instead of blue, the Dell still consumes seventeen watts of power, according to the cheap meter. Turning the thing "off" manually extinguishes the power light entirely, but only reduces the power draw to 12 watts. Turning the monitor off at the wall, of course, reduces the power consumption to zero. The Dell's power switch is of the softest possible type. It's a capacitive touch switch, with no moving parts at all - the switch is just a little hollow on the monitor frame. Capacitive switches are sleek and futuristic and cannot suffer a mechanical failure, but they have to be powered to do anything. Personally, I think I'd rather have an old-fashioned switch. Devices that have remote controls can justify a bit more current consumption, because they have to run the remote receiver, but the 3007WFP-HC has no such excuse. 12 watts of vampire draw just to monitor a power switch is a bit bloody steep, if you ask me. If I plug the monitor into a switched cord then I can easily turn it off properly. But sometimes, when I turn it back on, it forgets what its brightness setting was when I turned it off, and gives me 50% brightness instead. I often don't notice this until I start wondering why my eyes arel watering, by which time I now know the extra brightness has probably wasted more power than I saved by turning the screen off properly in the first place. Readers have alerted me to a couple of other meters currently available on the Australian market. This one being sold by Radio Parts Online looks exactly the same as the one I've got, but only lists for $AU29.50. There's also what looks like a local version of the Canadian UPM EM100, available from local seller Vidcam for $AU49.95 - but a reader who ordered one told me that what he actually received was one of the Jaycar meters, just like mine, which Vidcam cheerfully told him they just bought wholesale from Jaycar. I'm still not entirely confident that this cheap power meter is actually accurate, but it's passed the few tests I've given it with flying colours. I don't think Aussie shoppers will be able to find anything better for anything like this price, and pinpoint accuracy isn't important for household energy measurements, anyway. This little meter makes it easy to get a ballpark estimate of the instantaneous and over-time power consumption of just about anything in your house. Once you've got more detailed numbers than you can read off your main electric meter, you can figure out what's costing you money, and what's not worth worrying about. Air conditioners, clothes dryers, old leaky refrigerators: Bad. Old heavyweight linear plugpack power supplies: Probably negligible. This meter is also highly portable, which makes it easy for you to do comparative measurements. Suppose you've got an old washing machine, whose big motor has to work hard to turn its heavy drum, because the drum is counterweighted with concrete. With a meter like this, you can easily see how many kilowatt-hours the washing machine consumes in one cycle (not, mind you, counting any power you might use to heat water for a warm or hot wash). Then you can take the meter to someone else's house and see what their new lightweight washer consumes to do the same task. Crunch the numbers, and you can figure out how long a new washer would take to pay for itself, and weigh that up against your environmental concerns, or lack thereof. 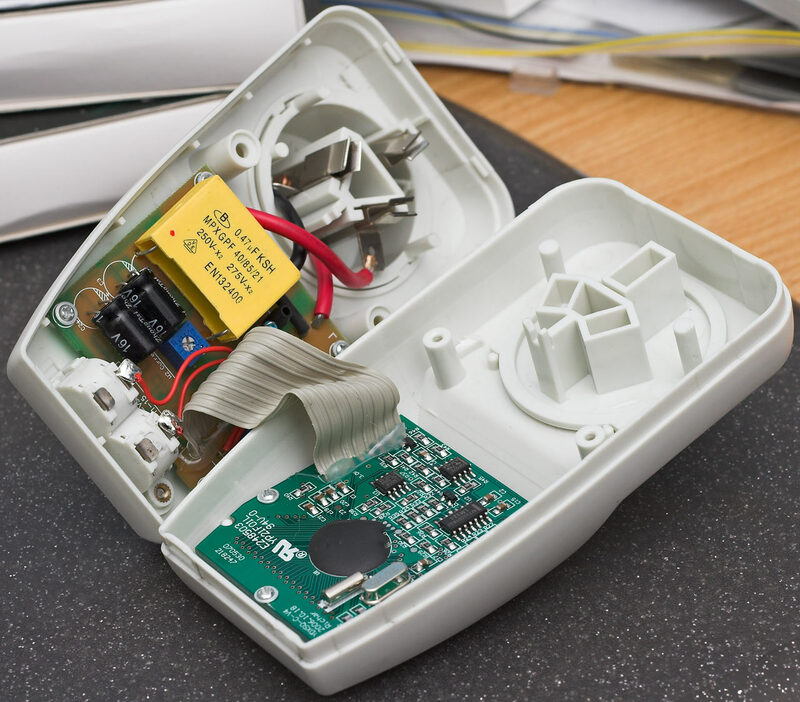 An electricity meter won't answer all of your power consumption questions. If you heat your house, for instance, every watt of "wasted" electricity inside your walls will actually be helping to keep the house warm. 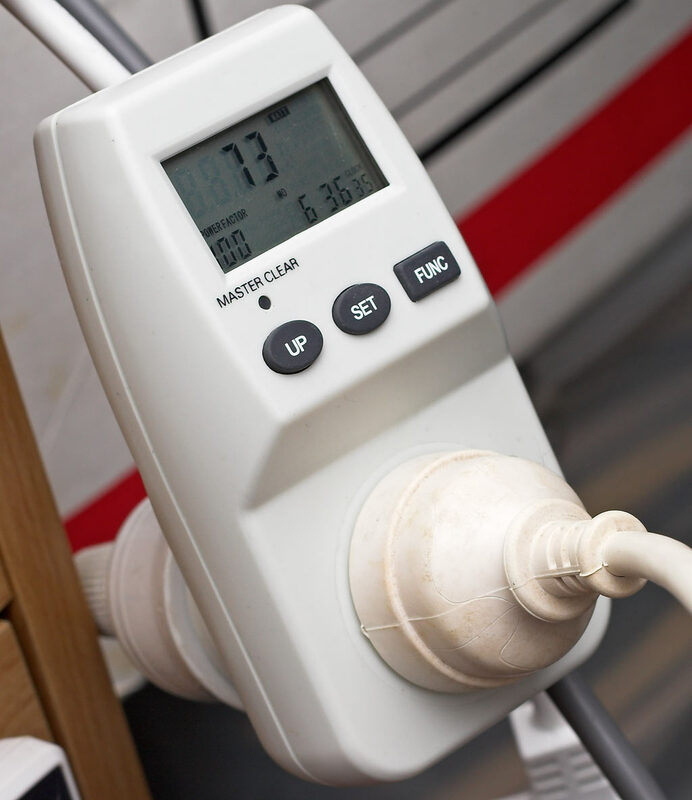 Cheap meters are also practically certain to fail to accurately record the power consumption of something that draws very short bursts of power to keep some standby circuit energised. But overall, these simple meters are tremendously useful. Every home really should have one. My meter is a Jaycar MS6115, retail price $AU39.95, or $AU46.20 including delivery anywhere in the country from Aus PC Market. Australian shoppers can click here to order one from Aus PC.